An order of monks and nuns who followed a strict ideal of abstinence, the Carmelites or 'White Friars' became prominent in England in the 13th and 14th centuries. They were well-connected with powerful supporters in the royal court. The Carmelite Missal was probably made for use at Whitefriars in London. Its beautiful decoration can be seen as an expression of both the White Friars' religious intensity and their highly placed patronage. At least three artists, one a foreigner, decorated it and introduced new ways of depicting the human figure and creating illusions of space. Their work brought English manuscript art into a new phase of the 'International Style' of western European painting. The missal's early 19th-century owner allowed his children to cut it up and paste scraps of its decoration into 'collages'. In the 1930s Margaret Rickert reconstructed the missal from its scraps. A reconstructed page from the Sanctorale or prayers for saints' feasts has several historiated initials (letters bearing pictures), each for a feast day and with portraits of saints or scenes relating to the feast. One shows Christ calling Peter and Andrew, which seems to be echoed by the lower margin's depiction of two men fishing with a net. 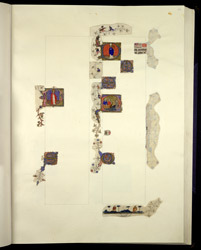 The multiple pictures and marginal figures hint at the richness of the book's original decoration.